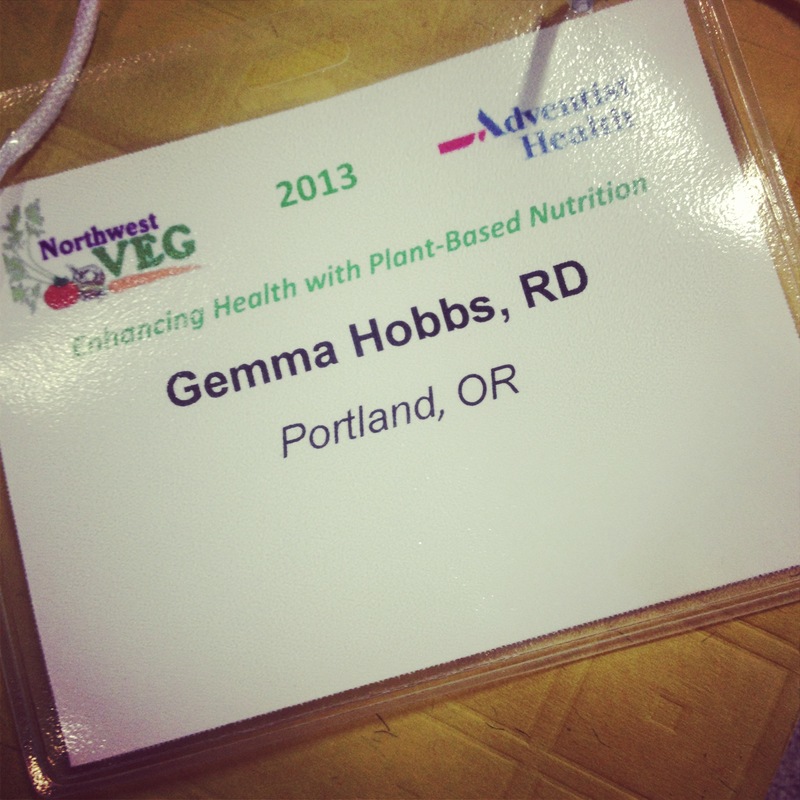 I had the pleasure of attending my first ever health conference as an actual health professional yesterday! The “Enhancing Health with Plant-Based Nutrition” conference was organized by Adventist Medical Center and Northwest VEG and was a great learning experience. Registered dietitians are required to earn 75 continuing education credits every five years to make sure we are continuing to learn in our field, and I had a lot of fun earning my first six! 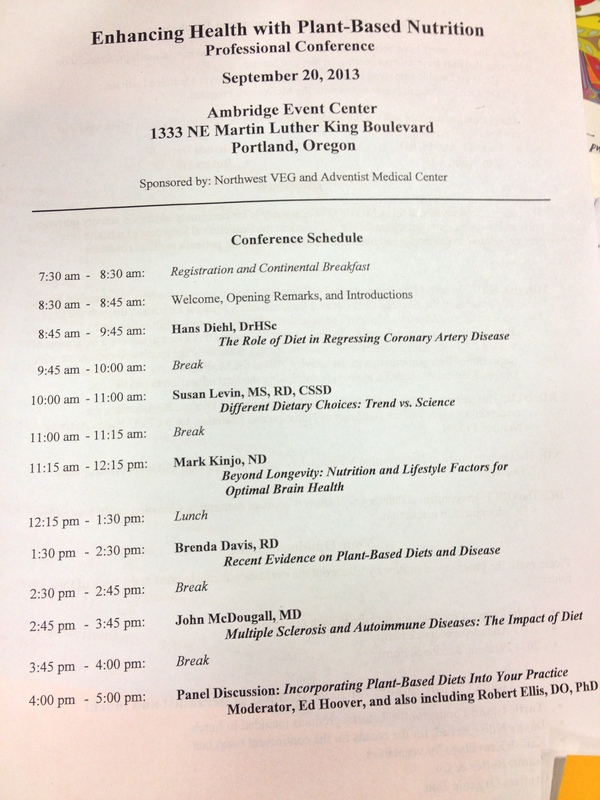 And as a vegan RD, I was so grateful that the Academy approved this lifestyle medicine conference for credit. Huge props to whoever organized the food for this event. 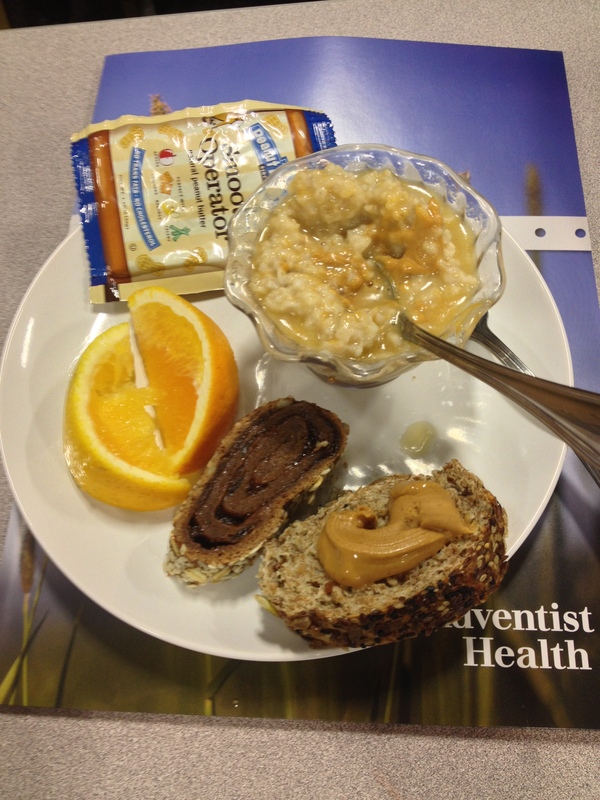 I was fed a hearty breakfast of oatmeal with PB. Lunch was a delicious buffet of all gluten-free and vegan items, ranging from cashew cheese spread over millet and tempeh, to tacos with delicious guacamole and salsa. But dessert really took the cake –we were treated to raw raspberry cheesecake. Drool! I really enjoyed the speakers at this conference. They spoke on a wide range of topics, from enhancing your brain health and preventing Alzheimer’s dementia with a plant-based diet, to one dietitian’s research in the Marshall Islands working with a population stricken with a diabetes epidemic. After hearing her tales of diabetes reversal and the new life and vigor these people have for plant-based nutrition, I was even more inspired to live my life as a joyful, vegan RD. 1. 51% of American calories come from processed foods. It’s hard to remember that outside of the Portland bubble, where everyone seems to care about locally-grown, whole foods, there’s an entire nation of people who are still surviving off of factory-produced or imported food. 2. The average American consumes 12 cows, 25 hogs, and 2400 chickens in their lifetime. 3. Blue Zones, or geographic areas that have been identified as spots where people live significantly longer than the average human and have a better quality of life in their golden years, have specific lifestyle factors in common: strong family ties, non-smoking, plant-based diets, a habit of constant moderate activity, and healthy social engagement. Read more about Blue Zones here. Here are some research articles about how people following a plant-based diet have been shown to live longer and have less incidence of chronic disease (including cancer and heart disease): Adventist Health Study, AHS-2 Fraser, Crowe, & Huang et al. Some of the specific patterns that have been isolated as promoting significantly higher risk of disease included red and processed meat consumption, refined grain consumption, and consuming foods rich in saturated fats such as sweets, desserts and french fries ( this was from the well-known Nurses’ Health Study, with fourteen years of data from over 69,000 nurses). I was particularly shocked to read about heart disease reversal and diabetes reversal in the Marshall Islands. Type 2 DM is the number one cause of death on these islands, and 50% of the population who are over 35 years old have it. I can’t even wrap my head around that, but I fear that our country may see these numbers someday (right now about 8% of our population has diabetes). Brenda Davis, RD, of the Diabetes Wellness Project traveled to these islands and helped to integrate a lifestyle change of exercise, stress management, and a fully plant-based, low-glycemic load diet. The results? Within two weeks patients who couldn’t walk without pain were starting to walk to the end of the block and back. Blood tests became normal — in fact, one woman’s HbA1C went from 8.7 to 5.7 (if you’re a health professional, you know this is unheard of without medication!!). I was so impacted by this project and the word Brenda Davis has done with plant-based nutrition. 6. Areas of the world that have the highest incidence of multiple sclerosis are also the areas of the world that eat the most meat and dairy (aka, have a higher saturated fat intake). Read more about this here. Dr. McDougall is currently conducting a study through my alma mater, OHSU, support his and the late Dr. Swank’s theory that MS can be halted with a low saturated-fat and plant food based diet. After all the brain-power that went into this all-day conference, I couldn’t wait to attend Portland’s annual VegFest today! I love this event for so many reasons — the people are friendly and informative, the vegan foods and products (books, clothes, kitchen-ware, makeup and toiletries, etc.) 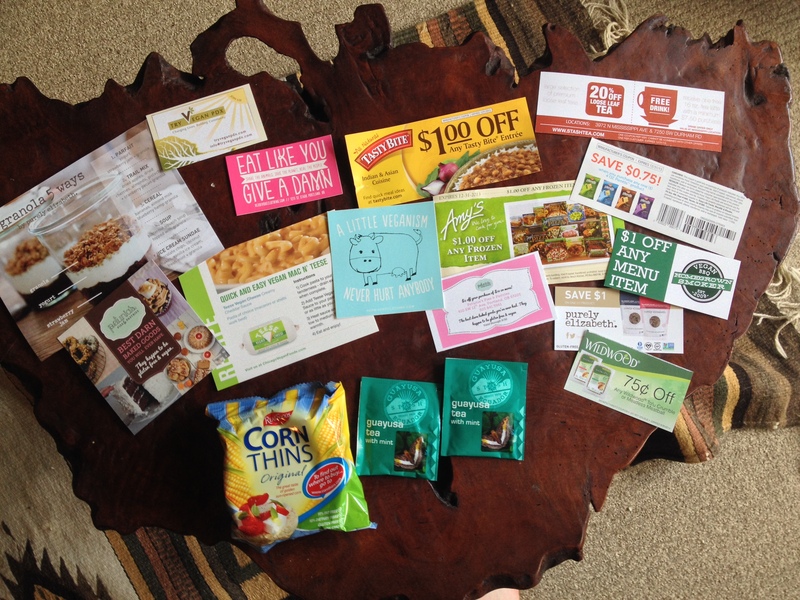 are delightful, and…perhaps most importantly…the free samples are EVERYWHERE! I purposefully skipped my breakfast because I knew I would be heartily nourished 🙂 I think my favorite had to be the cashew crème fraîche with fig. I mean. Of course, I couldn’t walk away without some treats. Apart from tasting about 9058723 samples of soups, kale chips, chocolates, vegan artisan cheeses, kombucha, power bars, popcorn mixtures, teas and coffees, I ended up with organic deodorant and an awesome zip up hoodie from Herbivore Clothing Company, a local and sustainable clothing and accessories shop in Portland. I can’t wait to check out their real location! Oh, and check out all those coupons and recipes! Apples with vegan caramel sauce. Perfect for fall! Pad Thai cooking demonstration — one of my favorite meals ever! 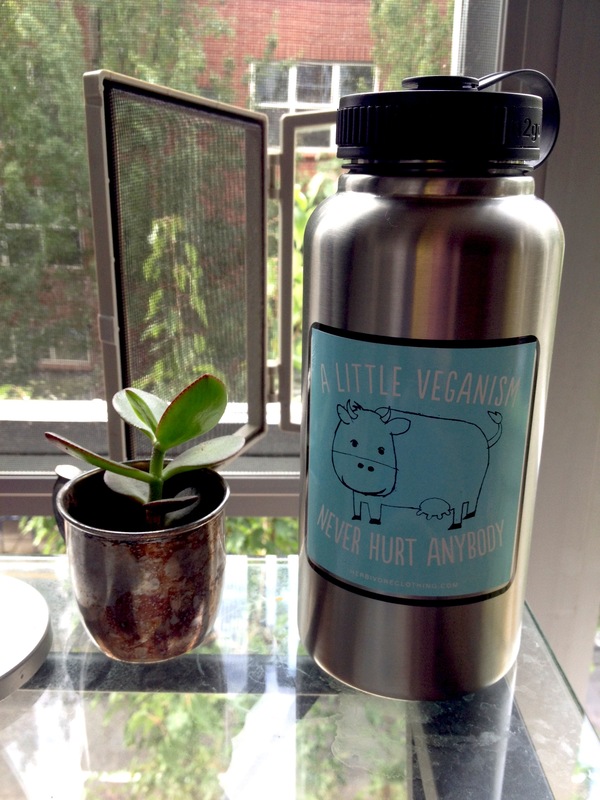 This is a startup company in Portland that makes plant-based milks, including pistachio and cashew milk. Delivery service included! 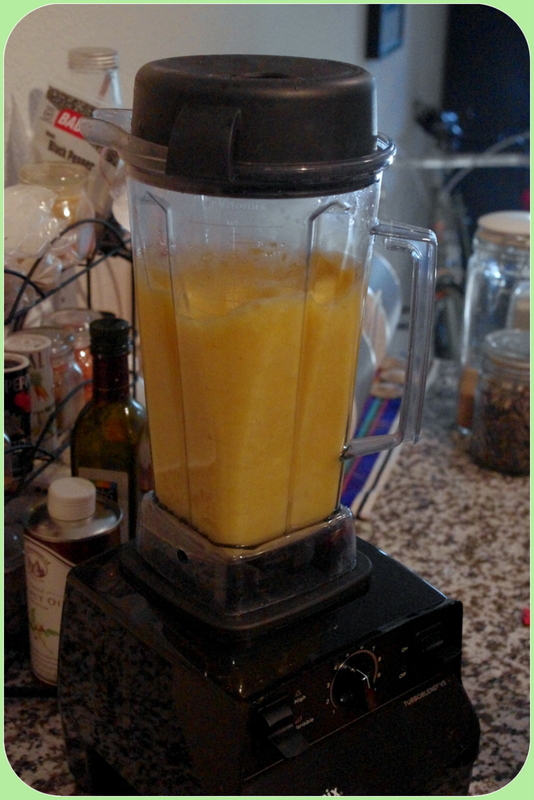 I’ve been hearing a lot about the health benefits of turmeric (aka curcumin), and wanted to experiment with it in the kitchen. Since it’s summertime and I really love an ice-cold, fresh beverage after a walk outside or sweating in the sun, a hot meal wasn’t going to work! 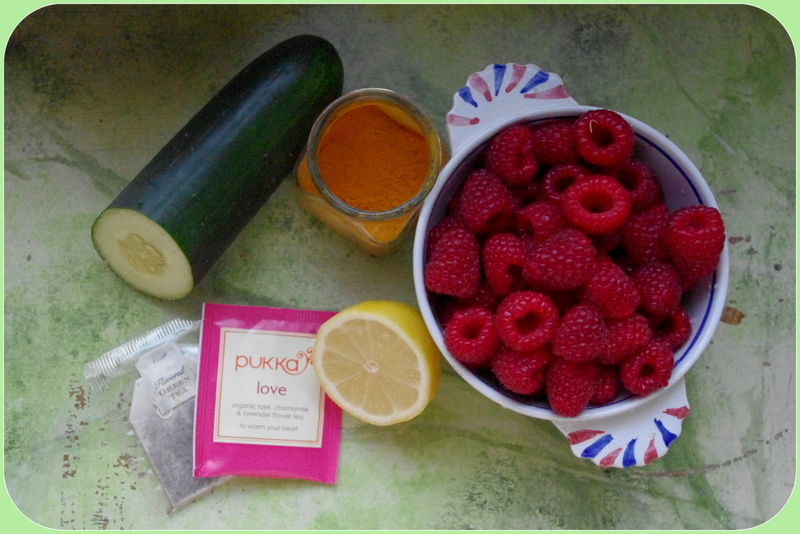 So instead, I present to you…my original turmeric & raspberry detox iced tea! As a Registered Dietitian, I’m obligated to say that your liver, kidneys, and intestines do a stellar job of clearing out the waste that comes from your food and environment. So any kind of “detox” program that you might want to try probably won’t be worth your money, and you might just end up spending lots of quality time on the porcelain throne. However….it’s definitely true that consuming certain foods will keep you regular and help you to avoid bloat, gas, and water retention. There’s no need to take supplements or choke down any nasty concoctions. Fiber-rich, whole foods (fruits, vegetables, and whole grains), combined with spices that have a functional benefit, can have a big impact on your intestinal, er, movement. 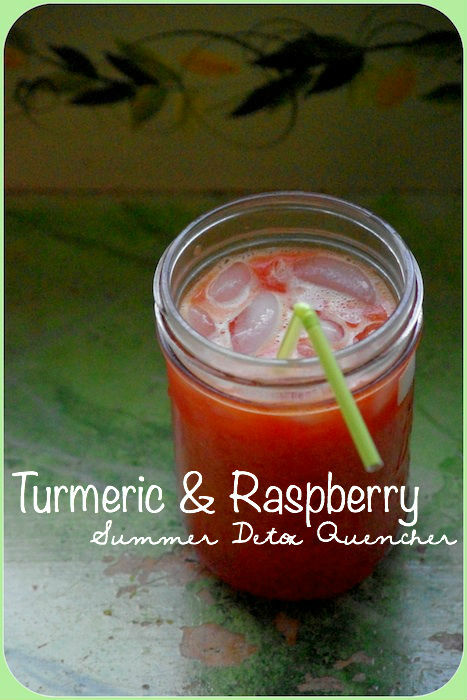 You can make this refreshing summer drink as long as you have a blender! With just five natural and whole ingredients, this delicious drink is just waiting to get in your belly and start hydratin’ you from the inside out. 1. Assemble your ingredients: 1/2 cucumber, 2 cups red raspberries, 1-2 tsp. 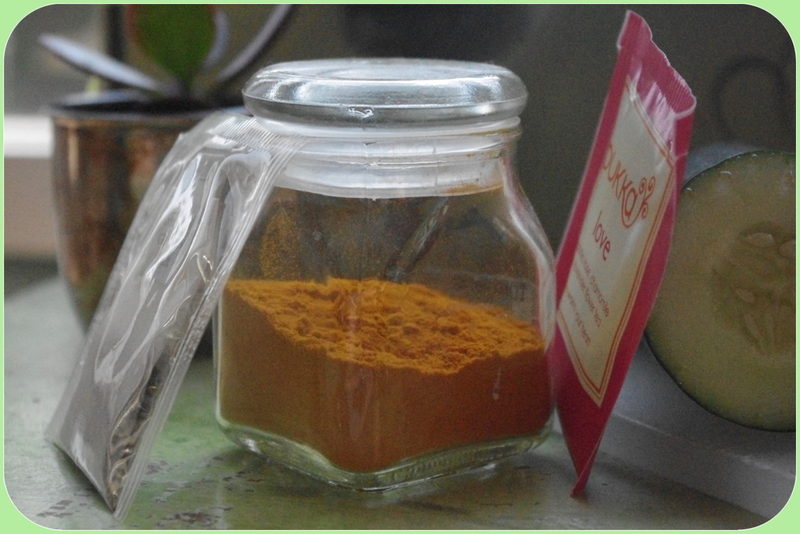 turmeric powder, and 2-3 tea bags of your choice. I’m obsessed with the Pukka “Love” right now, since it’s delicious but mild. You can choose a caffeinated or non-caffeinated tea, based on your preference. Caffeine is a mild diuretic and can help to promote digestion. 2. Brew the tea and let it steep for 3-5 minutes. Remove the tea bags and add turmeric. Blend. All that yellow is from 1 tsp. 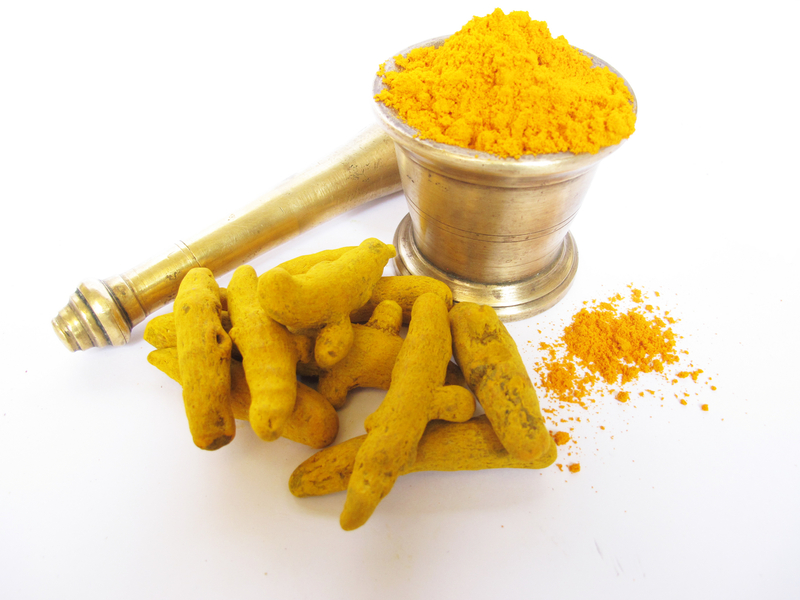 of turmeric! *Pro tip: TASTE TEST this recipe as you go. I don’t find the turmeric to be overpowering, but you might. Add 1/2 teaspoons at a time to make sure you don’t overpower your drink! Refreshing & hydrating beverage, or tequila sunrise? You tell me. 4. 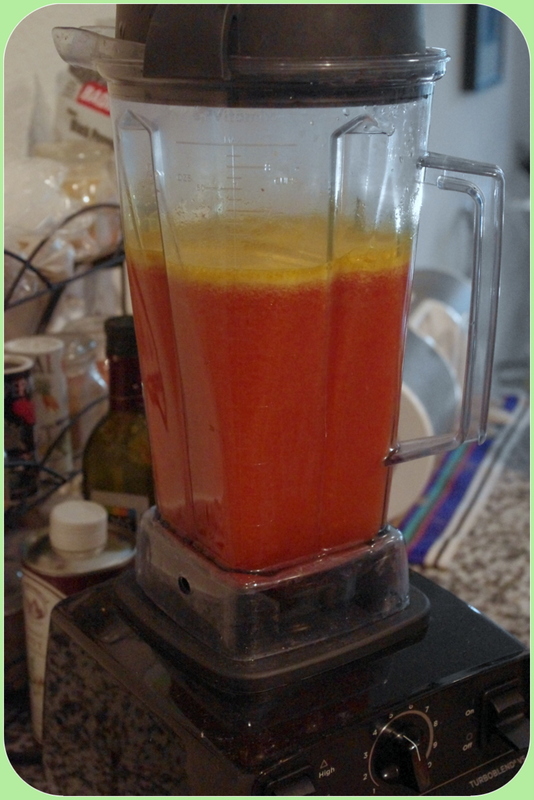 Pour the mixture into a carafe and stick it in the fridge to cool it down. 5. Serve with a straw over ice. Add agave and a tiny squeeze of lemon for added flavor. Lemon is also a mild diuretic and can help with getting rid of water weight if you’re feeling bloated, but it can easily overpower the fruit and zest in this drink. The raspberries serve as a great source of fiber (8 g per cup! ), and the cucumber is a fabulously hydrating vegetable with B vegetables to start your morning off with some zing, or act as an afternoon pick-me-up! I hope to see more research about turmeric in the future and will definitely be incorporating it into my diet more often.